Former President Fidel V. Ramos has cited San Miguel Corp. President Ramon S. Ang for his various big-ticket projects, describing the tycoon as a patriotic visionary and strategic thinker. The tycoon’s projects include the $15-billion Bulacan International Airport, water and power ventures and the extension of the Tarlac-Pangasinan-La Union Expressway all the way to Laoag, Ilocos Norte. The former president made the statement during the tycoon’s courtesy call the other day at the Ramos Peace and Development Foundation in Makati in the presence of FVR’s first Special Action Force commander now MWSS Administrator Gen. Reynaldo V. Velasco, new National Tobacco Administration director Gen. Wilson Victorio, engineer Alfredo Reyes, Freddie Jalasco and Ramos family biographer Melandrew T. Velasco. THUMBS UP FOR SMC. 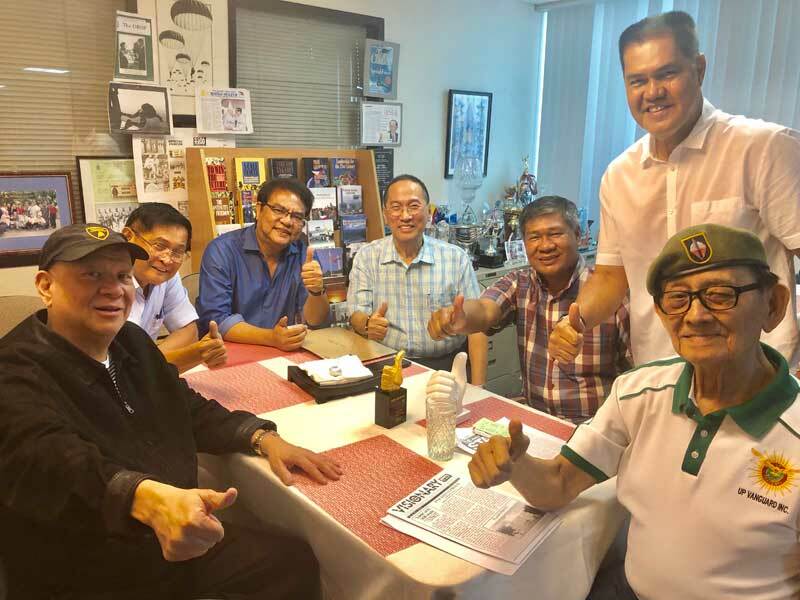 Former President Fidel V. Ramos and SMC president & CEO Ramon S. Ang (left) do the thumbs up sign during a courtesy call and meeting with FVR at his RPDEV office in Makati. Ang briefed FVR about the various mega projects he has set to venture in the next five to 10 years including the Bulacan International Airport, the extension of TPLEX initially to Luna, La Union and all the way to Laoag, among others. With them are Gen. Rey Velasco, Gen. Wilson Victorio, engineer Fred Reyes, sportsman Freddie Jalasco and FVR family biographer Melandrew T. Velasco. “Continue with the noble task of nation building with the various flagship projects you are pushing for the country and our people. It’s seldom that we find a great Filipino and an alumnus of the Far Eastern University [FEU] like you,” Ramos told Ang. FVR reminded everyone that the first extension school of FEU was in his birthplace in Lingayen, Pangasinan where growing up as a young boy, he used to be in that school building that had bowling alley and billiards. For his part, Ang told FVR that in his book, Ramos is a living Korean War and EDSA hero who fought Marcos and defended democracy from coups nine times during the Cory Aquino presidency and the milestone achievements he made in his six years as president are enduring that we all continue to enjoy today. “Sir, you are one of kind who comes only once in our lifetime and we Filipinos are fortunate to have a leader and a statesman like you who continue to guide this nation,” Ang told FVR. In his briefing to Ramos, an upbeat Ang unveiled his grand plan on the Bulacan International Airport, an unsolicited public-private partnership proposal from the SMHC to construct, operate, and maintain the airport on a 2,500-hectare land in Bulakan, Bulacan. “The airport project, estimated at $15 billion, will be undertaken over a period of five to seven years to full completion,” said Ang. He added that the Bulacan airport will have four parallel runways (expandable to six), and will be equipped with modern and world-class facilities. Ang told FVR that the new airport will create some one million jobs once construction starts, and by the time it’s completed, millions more of new tourism jobs will be created, “Travel will be much easier and more comfortable for our air passengers, for overseas Filipino workers, and foreign tourists. Access will also be very easy with multiple expressways that will bring the airport within 30 minutes or shorter from anywhere in Metro Manila,” he added. According to Ang, the airport is expected to accommodate 100-million passengers a year—a huge improvement compared to NAIA’s current capacity of just about 31 million passengers annually. He envisioned that the Philippines will attract more tourists in the coming years once the SMC airport will be completed in six years time barring no hitches. “In 2018, the Philippines only attracted 7.1-million tourists, compared to our neighboring countries like Thailand with 35.4 million, Malaysia (25.9 million), Singapore (13.9 million), Japan 28.6 (million) and, Indonesia 14.4 million, said Ang. Ang also threw his full support for the construction of new water supply sources projects under the New Water Security Roadmap crafted by MWSS Administrator Rey Velasco. In anticipation of the burgeoning population and expansion of the Bulacan Bulk Water Supply including the Bulacan airport, MWSS has identified the ABC Projects as part of its short and medium term water supply projects tailor-made for Bulacan Bulk Water. According to Velasco, the immediate development of the A-B-C- projects as alternative sources of water with a combined capacity to 1,950 mld is now a must. The so-called projects include maximizing the untapped water and water wastage from Angat; the Bayabas Dam Project in Doña Remedios, Trinidad, Bulacan; and the Candaba Multi-Purpose Impounding Dam in Pampanga. Bulacan Bulk Water started commercial operations under Stage 1 last January 14, 2018, following its milestone completion ahead of schedule. The MWSS chief lauded SMC CEO Ang for the speedy completion of the flagship project, the first major water project to be completed under the Duterte administration. “The Bulacan Bulacan Bulk Water is just one of the many projects that SMC has in store under the Duterte administration,” said Ang.